Lubinda has also urged African countries to put the hand hoe in museums and promote a mechanized and smart agriculture because he said “the hoe had outlived its usefulness in agriculture.” He added that this is especially true in the context of climate change in which production efficiency is of paramount importance. 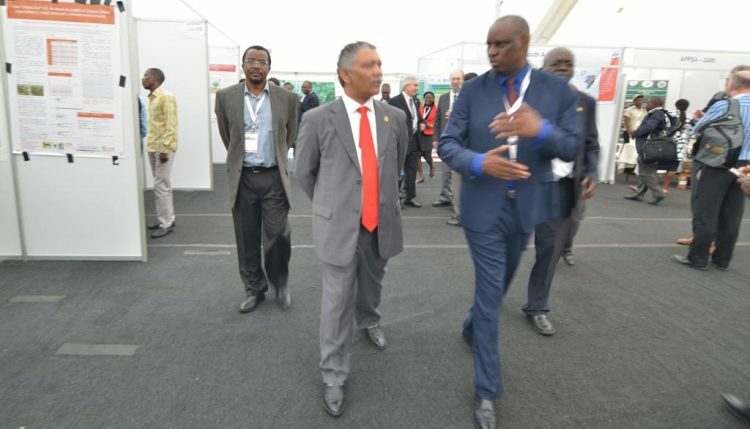 Minister Lubinda (middle) touring the poster stands while being briefed by Zambia Agriculture Research Institute (ZARI) Director Moses Mwale (right) as IITA Southern Africa Director Dr David Chikoye (left) walks alongside. He noted that 77% of the 60 million farmers in Africa were subsistence farmers growing crops on less than one hectare each. He said because of poor mechanization in Africa, 65% of the work force in African agriculture comes from human muscle compared to 35% in the rest of the world. He said there was need for the continent to promote a mechanized and smart agriculture as well as the introduction of digital or ICT solutions to enhance crop production. “The African woman and the African youth cannot continue to till the land using such backbreaking, inefficient, and archaic tools. “The youths who are driving modern computer based systems cannot be attracted to agricultural systems that are divorced from advanced technology,” Lubinda added.